American workers—especially in the Midwest and Northeast—are rapidly aging, graying, and retiring. 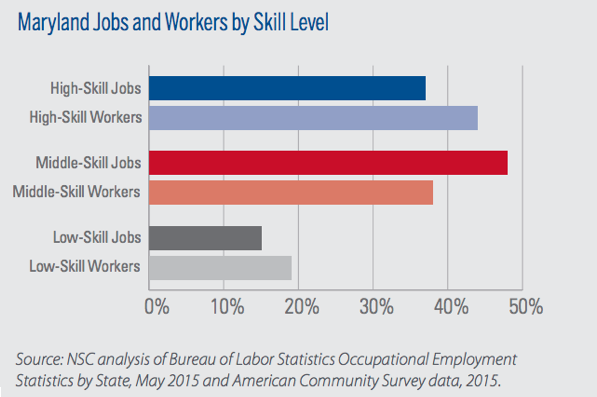 About half of the job openings expected over the coming decade are anticipated to fall within the “middle skills” category—jobs that require training beyond a high school diploma, but require less than a four-year college degree. Such jobs include many skilled trade positions, dental hygienists, and a variety of office jobs, such as insurance sales agent. While much has been written (and for good reason) about the importance of attracting and retaining highly-educated STEM workers (who have disproportionate impacts on economic growth, job creation, and regional prosperity), it is the loss of middle skill workers that is likely to create the largest number of unfilled positions in the regional workforce of most Midwestern states in the coming years. 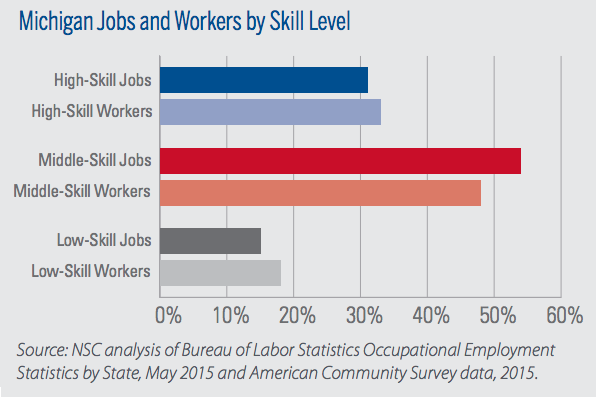 New research from Michael Richardson and our friend Amanda Bergson-Shilcock of the National Skills Coalition (Amanda is formerly of WE Global’s Philadelphia partner organization, the Welcoming Center for New Pennsylvanians) released in January 2018 highlights the middle skills shortages in Michigan and Maryland, the importance that immigrant labor plays in filling unmet talent demands, and suggests opportunities each state might consider to help immigrants prepare for these opportunities. Immigrants represent a critical component of virtually every WE Global member state’s efforts to close the middle skills workforce gap. Whether you take a five-year, ten-year, or fifteen-year horizon, immigrants account for most, if not all, of the population and workforce growth in most Midwestern states. In fact, between 2000-2015, immigrants make up about half the population growth in the Great Lakes Region (as defined by the New American Economy’s October 2017 report “New Americans and a New Direction: The Role of Immigrants in Reviving the Great Lakes Region”). The National Skills Coalition fact sheets highlight an even greater impact of immigrants on population growth in Michigan and Maryland. National Skills Coalition’s research also highlights important federal funding sources to help prepare immigrants with the skills demanded by Michigan’s economy, including opportunities within the Workforce Innovation and Opportunity Act (WIOA), the Carl D. Perkins Career and Technical Education (CTE) Act, and the Supplemental Nutrition Assistance Program (SNAP) Employment and Training program. 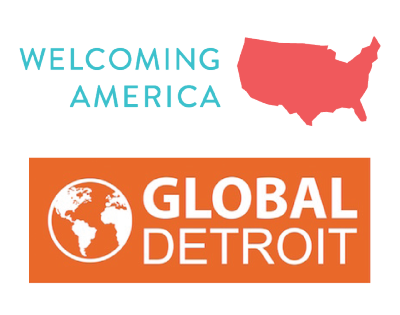 The Michigan research credits the work of Governor Snyder’s Michigan Office for New Americans (MONA) as playing a leading role helping to build more inclusive workforce development policies. Michigan and Maryland have leaders who have created specific state goals around insuring that a majority (60% and 55%, respectively) of the state’s workforce has a post-secondary credential by 2025. Both states will need to insure that training and workforce development programs are inclusive of immigrant talent to meet these goals. If you are interested in learning more about the opportunities to insure that your local training and workforce programs are inclusive of immigrants, please contact Amanda Bergson-Shilcock at the National Skills Coalition at amandabs@nationalskillscoalition.org.